Established in 2003, the COLE Leadership Fellows program engages a select group of Fuqua Second Year Daytime MBA students as stewards of the Fuqua leadership culture, committed to the development of fellow students and future Duke MBA graduates who exemplify the highest qualities of competence and character, who are global leaders characterized by self-awareness, ethical and moral sensitivity, integrity and personal courage. Each year, 40+ Second Year MBA fellows, are selected through a competitive, rigorous and well-documented vetting process, involving both an application and interview, receive training and apply their leadership skills in serving as peer facilitator and leadership coaches and mentors to all incoming First Year students and their teams. They play a key role in building and representing the leader of consequence culture at Fuqua. 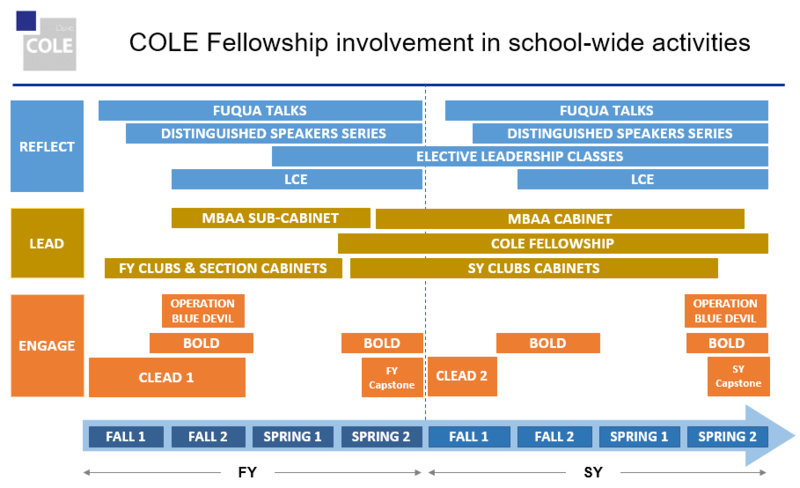 Why are leadership initiatives undertaken by COLE important to the Fuqua community? How do I get involved? What is the application process like? When: Applications are available only once a year and open to all first year students in the Daytime MBA program. Traditionally the application becomes available in December with it due in January.